When shopping for women at Christmas we normally gravitate to the usual options like perfume, skincare or a new pair of pyjamas. There’s nothing wrong with those items of course, but if you know that your girlfriend, sister, mum or any other female relative has a real passion for interiors, why not give them a gift tailored to what they love the most Whether she needs vanity storage, wall art or the ultimate bar kit our festive list of home goodies will give you the inspiration you need to start shopping now! Available in three different sizes, these ceramic vases from Michael Anderson Ceramics are the perfect gift for anyone who loves to fill their home with beautiful blooms. The stoneware and silk matte glaze give the vases an elegant aesthetic in tune with their Scandinavian roots. Not only can these be used to display fresh and dried flowers but they are ideal for organising an overly cluttered dressing table. Simply arrange makeup brushes as well as lipglosses, mascaras and other makeup items to clean up clutter in an instant! Choose from black or white or mix and style them separately or together to create a stunning focal point in any room. The great thing about these vases is that they all come carefully packaged in a festive red presentation box, making wrapping and gifting easier than ever. Every girl needs a good selection of visual inspiration, so why not give the gift of noteworthy artwork with this Follow Your Heart framed print? This square digital print comes with an adorable, unique heart-shaped mount and white frame so it can be hung up and admired as soon as it’s been unwrapped! You can never have too many blankets over winter as they can look just as stylish stacked up on a corner chair as they do wrapped around your shoulders whilst you watch your favourite feel-good movie. We love this Waffled Blanket from H&M which comes in both light pink and turquoise. This cute lightweight item is 100% cotton, machine washable and has the most usual mustard tassels to make it truly different from standard throws. For music-lovers, this Crosley Cruiser Antique Grey Bluetooth Vinyl Record Player is an affordable yet thoughtful gift. The retro style would fit an eclectic decor whilst the grey suitcase exterior acts as a handy way to hide it away when not in use. Don’t forget to include some classic albums too! Everyone loves a candle and Christmas is a wonderful excuse to invest in luxury brands when gift-hunting for family members. This Winter Signature Candle from The White Company is a firm favourite every year, boasting a warm spicy scent with aromas of cinnamon and orange. For those with small children or over-excited pets, opt for a flameless option with this Mini Diffuser Set featuring four different scents including Pomegranate, Ginger and Orange Rind. The keen traveller looking to decorate their space will absolutely love this unusual gold carved metal globe. Globetrotting has never looked so cool! Kitchenware is always a welcome gift, especially over the party season. Never turn up to a Christmas party empty-handed again with these Set of 4 Christmas glasses. 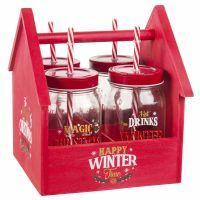 Perfect for hot cocoa doused with cream and marshmallows as well as warming mulled wine, both children and adults will appreciate these little mason jar glasses. Did we mention they are super Instagram-worthy too? Add a touch of greenery with this Orla Kiely Ceramic Pot with Wooden Stand. This stylish planter has the statement 60s stem print complete with a wooden two-piece, crossover stand and is ideal for holding smaller plants, blooms or herbs. Pop in your favourite evergreen plant to make it personalised. For those who like to entertain, this Neon Cocktail Sign is a real showstopper. Its bright pink glow will add sparkle to even the smallest midweek gathering as well as the finishing touch to any wild get-together. You could even throw in these Marble and Copper Bar Tools to make sure that the hostess has everything she needs to create the most professional mixed drinks at her next party! Fiona Thomas is a lifestyle blogger based in Birmingham. She graduated with a degree in Commercial Music where she snuck into several journalism classes and realised her real passion was writing. She had a successful career in management for several years before returning to her calling and started developing Fiona Likes to Blog, whilst working freelance for other websites. She is a keen advocate of positive body image, mental health awareness, fitness and wellbeing.